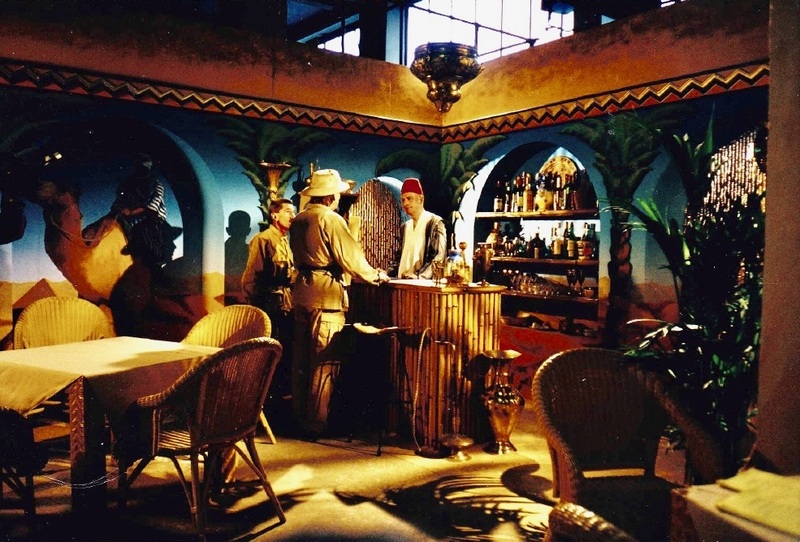 Barry Chuckle and his brothers have done umpteen series for children's Tv and I was co designer with my former Red Rhino colleague Sue Nelson on this interpretation of 'Indiana Jones and the temple of...."
We built the entire interior of an Egyptian Pyramid in the old scenery store at BBC Elstree. A network of corridors with revolving door, large swinging boulder and jabbing speared walls! It was entered via a 'breakaway wall' in this cafe set below! Other photos to follow if I can find them! The painted camel rider wall was a thin crust that broke through in a cloud of dust!